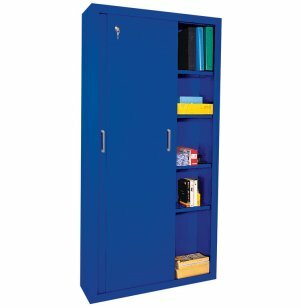 Steel storage cabinets are a great storage solution for a variety of applications. This Steel Sliding Door Storage Cabinet from Sandusky combines practical features and attractive aesthetics in a storage solution that's built to last. The sliding doors on this storage cabinet let you save on space, making it ideal for cramped offices or crowded classrooms; doors lock for extra security. Fully adjustable shelves adjust on 1" centers, with a raised bottom shelf to keep contents safe from floor-cleaning liquids. Welded, galvanized steel construction is extremely strong and stands up easily to heavy-duty, everyday use. 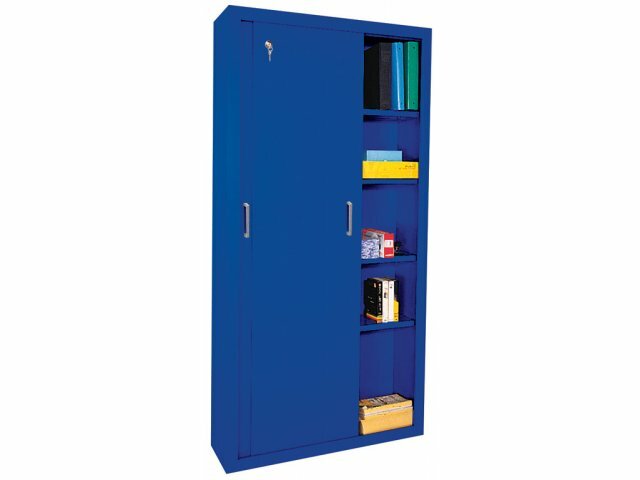 With a wide range of powder-coat colors, this Steel Sliding Door Storage Cabinet is a perfect choice for any school or business environment where tough storage solutions still need to look good. Ships assembled. Space-Saving: Sliding doors make this storage cabinet an ideal solution for hallways or tight spots that don't have enough room for a swinging door. Extra-Durable: Welded-steel construction is extremely strong and highly durable. Secure Storage: Doors lock for extra security. Height-Adjustable: All shelves are fully height-adjustable in 1" increments. Scratch-Resistant Finish: Powder-coat finish is scratch and peel-resistant. No Assembly Required: Ships assembled, so all you have to do is unpack the storage cabinet and you're ready to go.